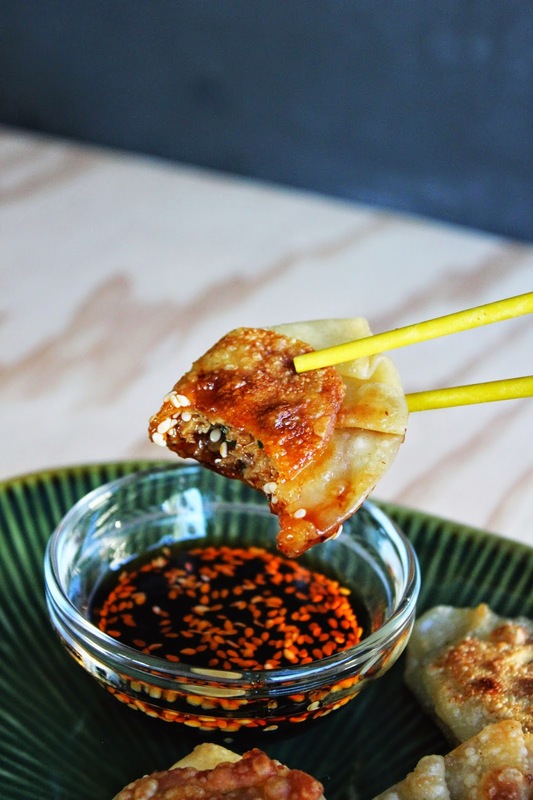 Lately, I've been loving pot stickers! When I was researching recipes for my project, I knew I wanted to try cooking these. I've never made them before and I learned that they are really easy. The hardest part for me was folding the wrappers, I definitely need to practice that more, but they still tasted delicious. The original recipe called for Chinese chives (garlic chives), which I could not find easily. So, I used regular chives and a clove of garlic. If you can find the garlic chives (or you're growing your own) feel free to use those and omit the garlic! This was a fun recipe and the dipping sauce was so good and spicy! *recipe adapted from China Sichuan Food. Her blog is filled with Chinese recipes! Making the filling is really easy. The whole dish is actually pretty easy, but let's start with the filling. In a bowl, combine the ground pork, egg, chives, garlic, ginger paste, oil, salt, and pepper. You'll want to mix it until it's smooth like a paste. Once it's mixed well, get your frying pan ready. I used a cast iron pan and added enough vegetable oil to coat the bottom of the pan. 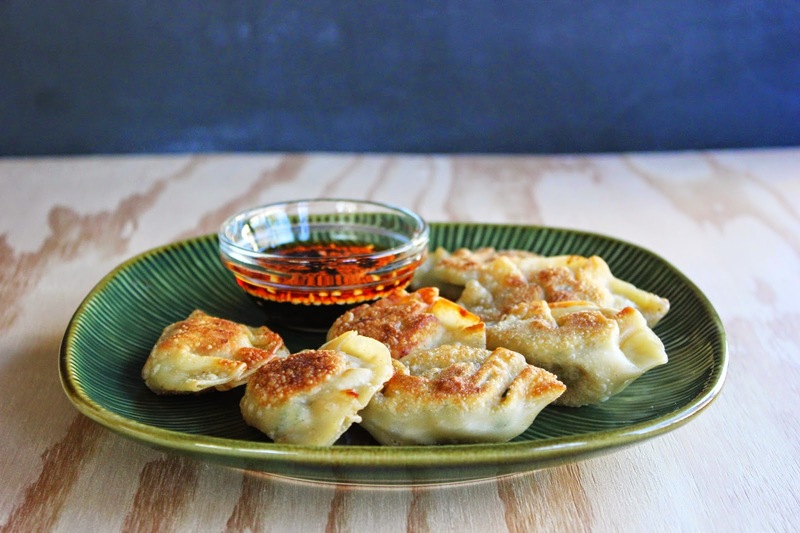 You don't want too much, but you want enough so the pot stickers don't get stuck to the pan. Now it's time to wrap your dumplings. Hold the wrapper flat in your hand and add a little filling to the center. Wet the edges of the wrapper, so it will stick when you fold your dumpling. There are many ways to fold dumplings, but I made little moons. I folded the wrapper in half and pleated the edges closed. Make sure you pinch the edges well, so they don't open while you're cooking them. When you have all your dumplings ready, it's time to fry. 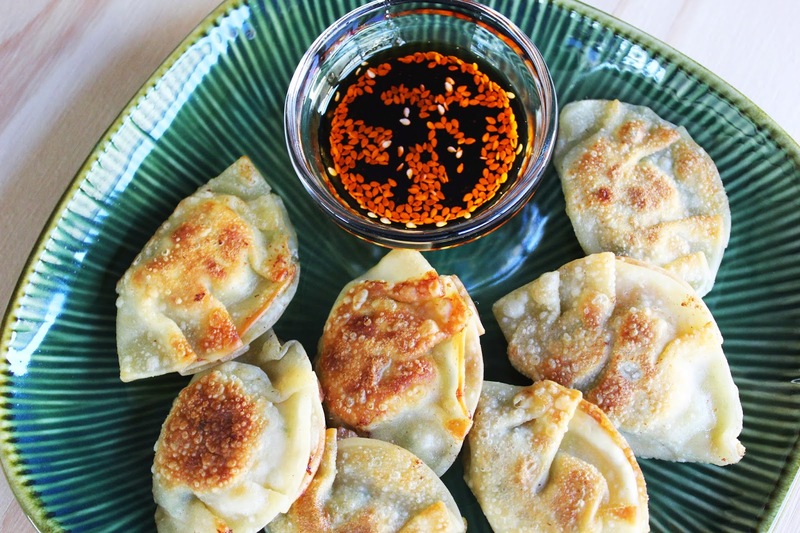 Carefully place a pot sticker in a hot pan (medium heat) to test if your pan is too hot. You want to be able to leave the dumpling on the pan long enough to cook the pork thoroughly without burning the wrapper. Once your pan is at the right heat, carefully place the remaining pot stickers in the pan. I cooked mine on both sides for about 3-4 minutes each. Drain on a plate lined with paper towels for a minute before serving. Serve with the following spicy dipping sauce. In a small dish, combine and whisk (I used a fork) together the soy sauce, chili oil, sesame oil, salt, and sesame seeds. For extra flavor, you can also add some of the chives. I loved cooking this! 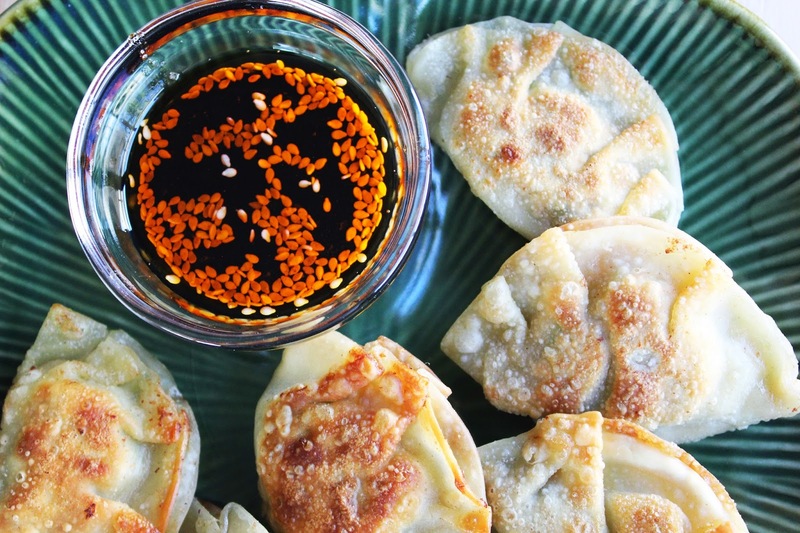 Have you tried making pot stickers before? If not, let me know how this recipe goes. Enjoy! They look delicious! Definitely going to try this! !